Troy Lamson’s high-level grappling skills were on full display Saturday night in Schaumburg, with the Michigan State wrestler repeatedly putting Combat Do’s Angelo Rivera Jr. to the canvas in a five-round, unanimous decision win that earned him the Praetorian MMA welterweight title. Lamson set the tone for the fight early in round one, proving he was much more than just a wrestler. He quickly finished a single-leg takedown on Rivera, then took his back and immediately set his hooks in deep. From there Lamson landed a barrage of strikes while looking to catch chokes. He kept Rivera on his back for almost the entire round. Rivera did a solid job of covering up and preventing major damage, which was the only thing that kept it from being scored a 10-8 round for Lamson — something nearly unimaginable considering Rivera’s skill set and pedigree. Rounds two through five weren’t much different. Lamson scored takedown after takedown, nullified Rivera’s striking and fought off Rivera’s attempts to sweep and catch submissions. Rivera was able to make things interesting in the fourth round. Although Lamson was able to get to full mount, Rivera was able to walk the cage to get out of it, and put Lamson into a triangle choke in the process. Lamson said in the post-fight interview that he was nervous at first when Rivera caught him in that, but he was able to escape. Rivera shot on Lamson to start the final round, but Lamson stuffed it and took him down. Rivera was able to get to half-guard on Lamson, and went for a knee bar but couldn’t get it. He also briefly had a chance at a heel hook, but Lamson was able to twist out and take Rivera’s back. He flattened him out and tried to sink in a choke with ten seconds left, but the round ended. 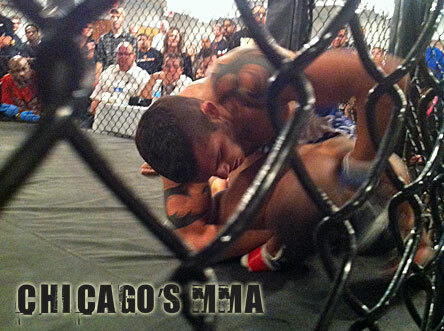 It was a dominant performance against one of Chicago’s best fighters. However, Lamson was not as impressed with his own work. “I didn’t come out and perform as well as I thought, but I kept the pressure on him like I wanted to and got the W, which is the most important thing,” Lamson said. Lamson was likely speaking to his inability to finish the fight, but that’s where Rivera deserves a lot of credit. Lesser fighters would have found a way out after being repeatedly taken down and having to defend strikes and submission attempts from the bottom. Rivera kept fighting, kept looking for a way to win, despite being on the mat for nearly five rounds. While Lamson clearly won the fight, Rivera certainly showed enormous heart in trying to defend his title. “I’ll definitely be back again after my NCAA wrestling career at Michigan State is over this year,” Lamson said. Rivera Jr. will also be back, and he hopes he can get a rematch with Lamson. Something I’m sure Chicago fight would enjoy.